During last week’s practice I discussed a basic tactical model to analyze your opponent and build a game plan in foil fencing. However, the Tactical Wheel applies to all weapons and is really helpful to beginners to get a deeper understanding of the game. In fencing, like in chess, you can only really start to appreciate the depth and fun of the game once you get a basic understanding of moves and counter moves. In this blog I offer a more detailed explanation of the Tactical Wheel. The tactical wheel shows the four basic tactical options in fencing, starting with a simple attack. The attack can be countered with a parry and riposte. In turn, a parry and riposte can be trumped with a compound attack. 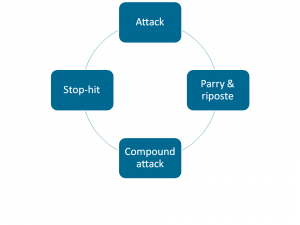 The compound attack can be defended against with a stop-hit, and finally, to counter a stop hit a simple attack can be made. The most basic fencing action to try and score is a simple attack. The fencing rule book states that an attack is “the initial offensive action made by extending the arm and continuously threatening the opponent’s target, preceding the launching of the lunge or flèche” (t.9) In practice, you gain priority, i.e. the right of way and ability to score a touch, if you are the first to start the attack by starting to extend your arm, while also moving forward. If you move backward and extend, you are making a counterattack. More on that below. Note that you only need to start to extend to start an attack, you arm does not need to fully extend. The simple attack means that you finish your attack in one fencing time. Fencing time is the time that you take to complete a single fencing action. An advance thus consists of two tempos: the advance of the front foot and closing up of the rear foot. You can immediately appreciate that tempo is not a set unit of time. You can make your advances quickly or slowly. In order to defend against an attack you can make a parry. A parry is defined in the fencing rule book as “the defensive action made with the weapon to prevent an offensive action arriving.” Basically it means that you deflect your opponent’s blade with your own. A parry gives you the right to riposte: “the offensive action made by the fencer who has parried the attack.” Note that the rules say “an offensive action” and not “attack.” This means that a riposte may also be parried. If you parry riposte, you can make a counter-riposte : “the offensive action made by the fencer who has parried the riposte.” So essentially, if you know how to parry and riposte you also can make a parry and counter-riposte. You have probably found yourself in a situation where you go back and forth parrying and counter-riposting without anyone scoring a touch. While this looks cool in a movie you need to keep in mind that actors are only pretending to stab someone. Fencing is about actually stabbing your opponent. To be able to score a touch on an opponent who is very good a parry simple attacks and ripostes, we need to continue in the Tactical Wheel. According to the rules of fencing an action is compound when it is executed in several movement, i.e. more than one fencing time. A compound attack thus differs from the simple attack because it takes at least two fencing times. For example, you feign a simple attack to an open part of your opponent’s target, expecting the parry, you move your blade slightly down to avoid their parry and move toward the newly opened target to finish your attack. Since the riposte is nothing more than an offensive action after the parry, you can also do a compound riposte this way. To deal with a compound attack, you can make a stop-hit. A stop hit is a counter offensive action made into an attack. Crucially, for the stop hit to be valid, you need to make sure that the attack does not go through. The fencing rulebook has the following to say about the stop hit: “When compound attacks are made, the opponent has the right to stop-hit; but to be valid the stop hit must precede the conclusion of the attack by an interval of fencing time; that is to say that the stop hit must arrive before the attacker has begun the final movement of the attack.” You can imagine that an interval of fencing time is hard to judge for a referee. Therefore, in practice it is best to avoid getting hit altogether after making a stop hit. You can do this by either quickly retreating or making a parry after the stop-hit lands. Finally, we come full circle. Since the stop-hit needs to arrive at least one fencing time before the final movement of the attack, the simple attack (which is only one fencing time) beats a stop-hit. The Tactical Wheel is only a model for fencing tactics. To paraphrase sir George Box: like all models it is essentially wrong, but I think it is useful. Especially for beginning and intermediate fencers it offers guidance on how to analyze an opponent and come up with possible solutions to their actions. With the four basic ingredients of the Tactical Wheel you will be able to cover all commonly occurring situations in a bout. Obviously there is more to fencing, and higher level fencers may want to expand their repertoire. For more in-depth discussion and more complete tactical model I can recommend the book Fencing and the Master by Szabo.